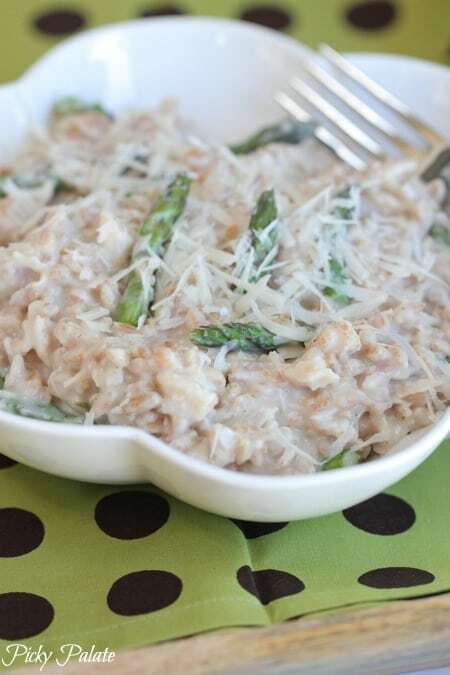 This Creamy Romano Chicken Farro makes a delicious side dish or light dinner. Add any vegetable you have in the refrigerator that needs using up! Have you tried farro before? I just had some of the best farro I’ve ever had in Park City a couple weekends ago from the amazing Deer Valley Resort chefs. It was cheesy and fabulous. I made my own version for you today, it is down right irresistible. 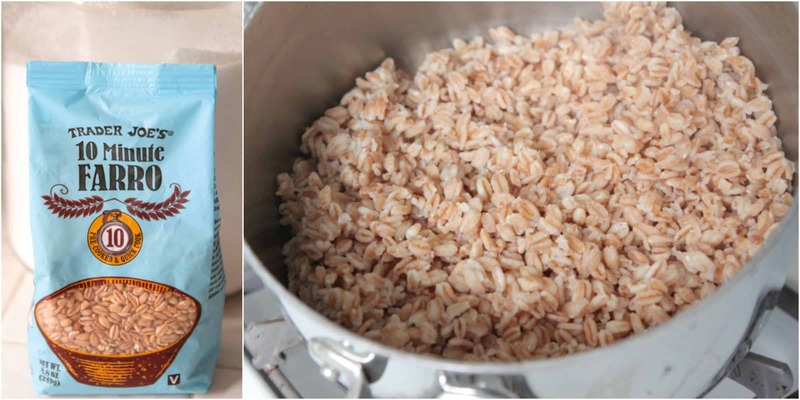 I highly recommend this 10 minute Farro from Trader Joe’s–it literally cooks up in 10 minutes. Quick and easy! Farro is one of those ancient grains. The best part is there’s plenty of vitamins A, B, C, & E, fiber, protein, and magnesium. For more info on Farro, see here. Time to make the cheese sauce. Start by melting your butter and whisking in your flour, salt and pepper. 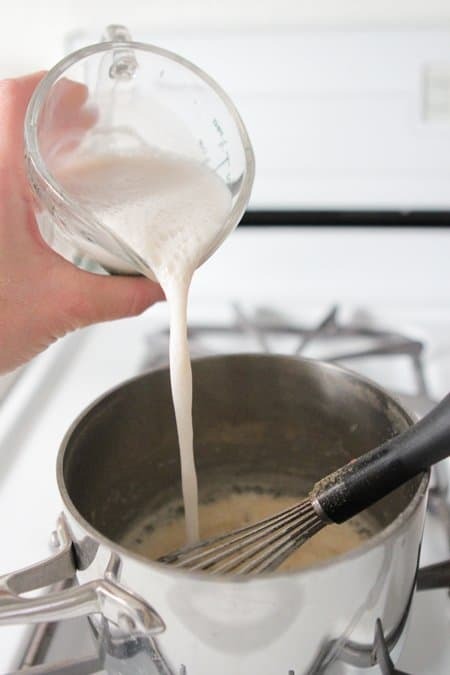 Slowly whisk in your milk until thickened and hot. 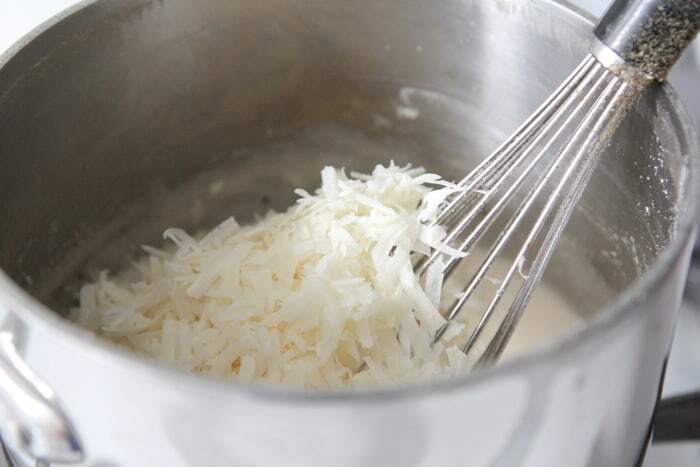 Stir in your cheese, I used fresh grated Romano cheese today. A delicious choice. Stir for a few minutes until nice and thick. 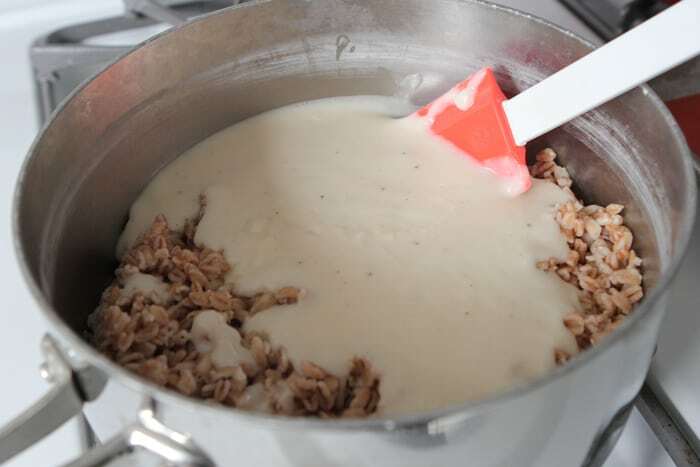 Pour your cheese sauce into the cooked Farro. I used some steamed asparagus, but haricot vert works great as well. Stir in some cooked shredded chicken too. Wait until you taste this. I topped mine with a little hot sauce for a little kick. Enjoy! Cook farro according to package directions. Drain and set aside for a few minutes. Melt butter in a small saucepan over medium heat. 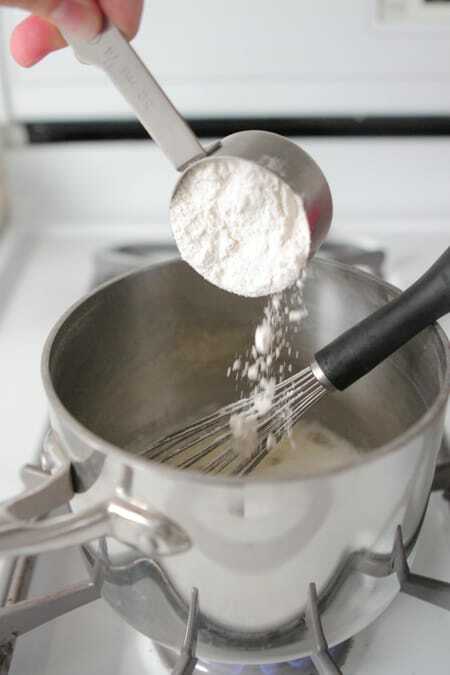 Whisk in flour, salt and pepper whisking until thickened and bubbly, about 1 minute. 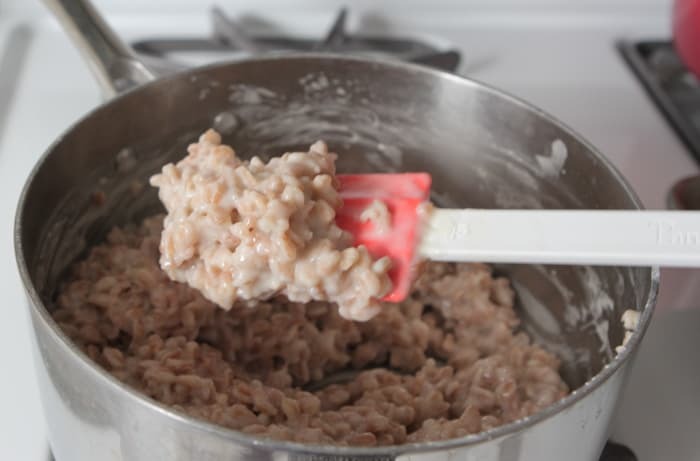 Slowly whisk in milk, stirring until thickened. This takes a few minutes. 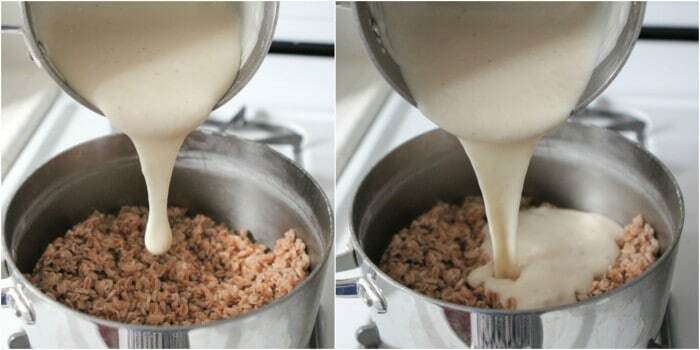 When thickened, add cheese, stirring until melted. Place cooked farro into a large saucepan over medium-low heat. 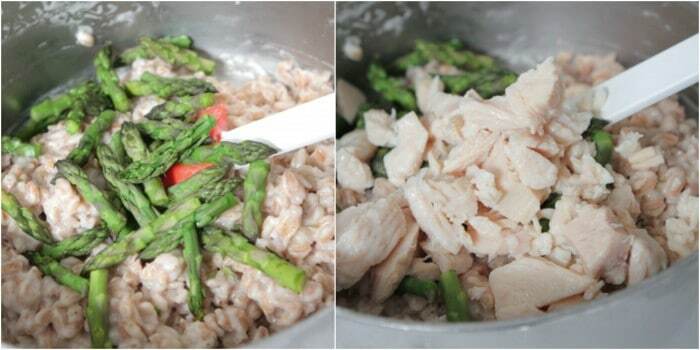 Pour cheese sauce over farro and add steamed asparagus and cooked shredded chicken. Stir and season with additional salt and pepper to taste. 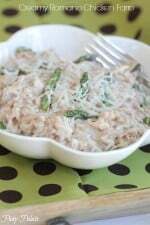 I’ve never tried farro, but this looks like a creamy risotto, so I’ll definitely be giving it a go. I love that my fellow bloggers challenge me to try new things. I’ve never tried farro. Now I’m curious. Looks delicious! Looks so creamy and delicious! I have never tried farro, but the way you just made it looks too good not to try! I like the use on farro in a side like this! oh yum! I have never seen Farro made any other way except a salad I guess? But this looks amazing and cheesy and delicious!! I just made farro too:) Can’t get enough! 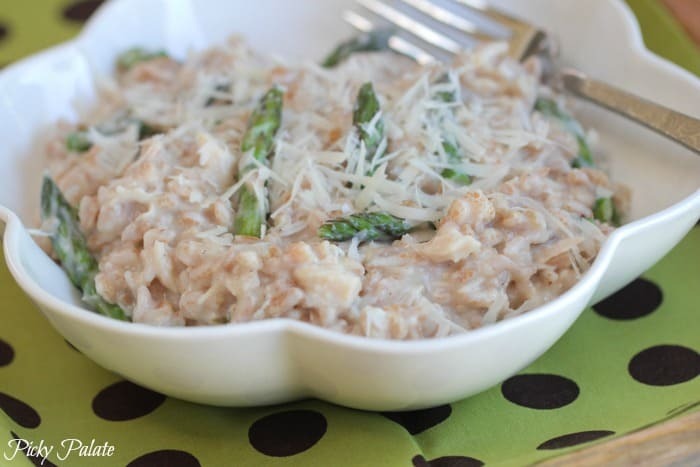 Farro looks like a versatile dish! I need to get my hands on some 🙂 this looks great with that cheesy sauce! I must live in a cave! I have never heard of farro. Must try this! This needs to be lunch! Looks delish! 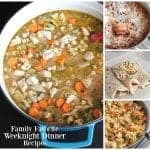 Perfect dinner for us, especially with those veggies added in! 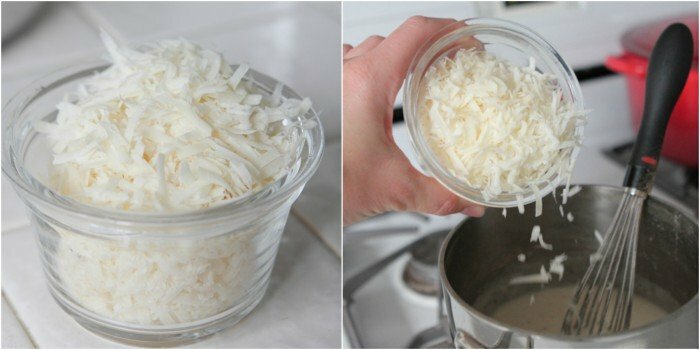 So easy and comforting — I love it! Looks awesome. 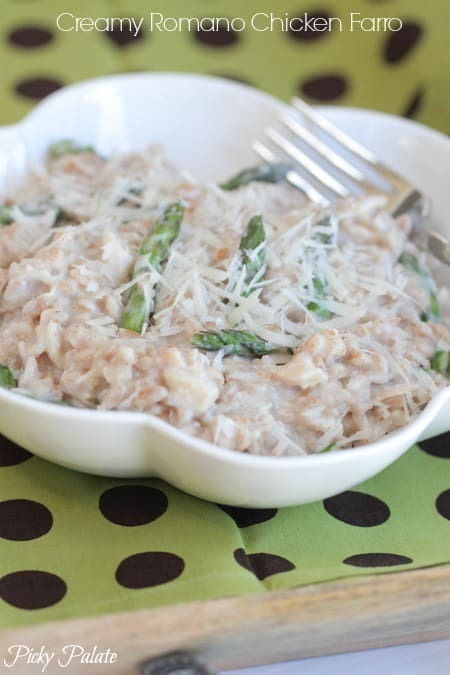 I’ve never had Farro… what does it taste like or does it even matter with the cheese sauce? YES, please!! This looks SO good!! I’m obsessed with farro!! Look at this cheesy goodness – love!! Love farro!! Great recipe, Jenny! Thank you so much Denise, it’s great to have you! I had the luck to be going by a Trader Joes one day and picked up the quick cooking farro. I made this dish and it’s delicious. Although I omitted the chicken in this dish it was still delicious. I served it with sesame crusted Ahi tuna with a wasabi cream sauce on the side. I love the ‘bite’ of the farro. It’s very filling, too. I’m a barley lover and farro reminds me of barley.. but with more chewiness to it. I added snow peas to my dish. Asparagus will be on sale next week. I’ll try it again with the chicken!